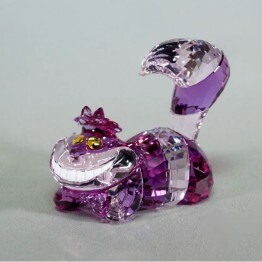 Inspired by the famous Disney story, Swarovski has produced Alice in Wonderland! The story of Alice in Wonderland is about a little girl called Alice. One day she sits on a riverbank with her sister, when she suddenly sees a running talking white rabbit. She goes after the rabbit and calls to him, but the rabbit is clearly in a hurry. Suddenly the rabbit enters a rabbit hole, and Alice decides to follow him. She falls down and comes to a small door with a talking door knob. This door gives access to a wonderful world, where nothing is what it seems. Wonderland, a very strange world, but that is the beginning of a series of fantastic adventures. Only, the door is too small for Alice. 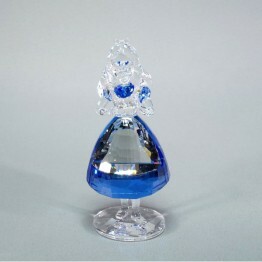 Then she sees a mysterious bottle from which she drinks. This makes her small enough to go through the door. When she has gone through the door she enters into a world with all talking characters like the Mad Hatter, the March Hare, the Queen and the Cheshire Cat. Lewis Caroll recounted the story and told it to 3 sisters and Robinson Duckworth. These people were very excited about it and therefore he made a book. On February 10, 1863, the book was finished. In 1865, the book was released for the first time by publisher Alexander Macmillan. The illustrations were from John Tenniel. The book was meant for children, but different from other children's books. In 1951, Walt Disney filmed the story. This is probably the most famous version of Alice in Wonderland. The official name of Alice in Wonderland is Alice's Adventures in Wonderland. Already 2 years after the book was published in 1865, it was translated into German and French. The story of Alice in Wonderland is seen as a modern fairytale and is appreciated by young and old.